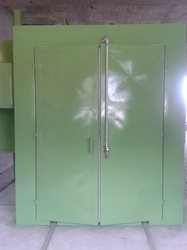 Prominent & Leading Manufacturer from Ghaziabad, we offer curing ovens. We are manufacturer of Curing ovens. We sell certified ovens with TTR profilling. Temprature does not excced more than 10 degree centigrade on the metal propes. Our ovens are fully automatic and highly efficient.